Warning: I might litter this review with a few bad apple puns (haha, there's one for you already...!) because I'm feeling creative, and creativity is the name of the game with this brand. Bad Apple Cosmetics are new to the UK beauty scene with a collection of polishes and nail wraps, from gorgeous apple sweet shades like Gala Pink and Green Bramley, to 3D shimmer shades and nail wraps detailing tiger print, florals, swirls and neons - there's definitely something to suit everyone. Their products are made in the UK and are free from harsh chemicals like Formaldehyde and nasty Parabens. There are two core (!) collections available at the moment, block colours and shimmery 3D colours. The block colours are bright, fresh and encompass a range of colours that wouldn't look out of place on an apple stand at the greengrocers. I know not everyone wants to wear juicy (!) bright shades like these but I think they would add an amazing pop of colour to any outfit. The 3D shimmer shades are beautifully iridescent and add a gorgeous shimmery shine to your nails. The polishes are all super long lasting, chip resistant and add a high gloss to your fingertips. The best bit about the 3D shades is the change in colour when you move you hand or catch the light, almost like two polishes in one! These gorgeous nail wraps definitely add to the big nail wrap trend of the moment. Bad Apple has a complete range of 8 designs, however the website also boasts the idea that Bad Apple are the first in the world to apply any picture/design to a nail wrap. I would be intrigued to see this happen, but there's not an option to buy such a wrap on the site that I can spot. These wraps are super easy to apply and are great for first time nail artists or anyone who wants a quick and easy nail pick-me-up. All you have to do is peel back the sticky bit of the wrap, apply it to the nail, fit it to your nail's contours, and then file to shape perfectly. All bad apple products are available on their website: www.badapplecosmetics.com, however their website is questionable and I think needs a little work. There are pages on the site devoid of important text (e.g the 'Bad Apple Stockists' and the 'Bad Apple News' links at the top of each page). I have also found the same picture being used for two different polishes (Arkansas and Arlington I'm looking at you) and some of the descriptions look as though they have been copied and pasted. The description for Arkansas (a shimmer 3D polish) starts out by describing the 3D shades and then slots in a description about Red Delicious being a stunning deep red shade. Other descriptions however are for the correct polish. Furthermore the brand seems to be having a slight issue with its pricing, some polishes are priced at £9.95 (as detailed on my press release) yet other are priced at £9.95 but only because they appear to be on sale for 33% off (normal price £14.95). So I cannot give you a concrete price, but I am going to go with the £9.95 per 14ml as stated on my press release. The nail wraps are also priced at £9.95 but one was retailing at £9.00-£9.95. Are you as confused as I am? But hey, I'm not here to review their website (although it is an important part of the brand)! I was sent Bad Apple's 3D shimmer shade, Red Cape to try out and on initial thoughts it does exactly as it says on the tin, providing me with a lovely shimmery, high shine shade that transforms from a deep purple to dark bronze in which ever way I move my fingers or they catch the light. I was impressed with the application, the polish was not too runny, it coated the nail well and didn't take long to dry at all. Two coats were all I needed to create this fabulous nail effect. The only downside was that my nails began to chip after two or so days, but I remembered later on that I hadn't applied a top coat so maybe that's my fault? 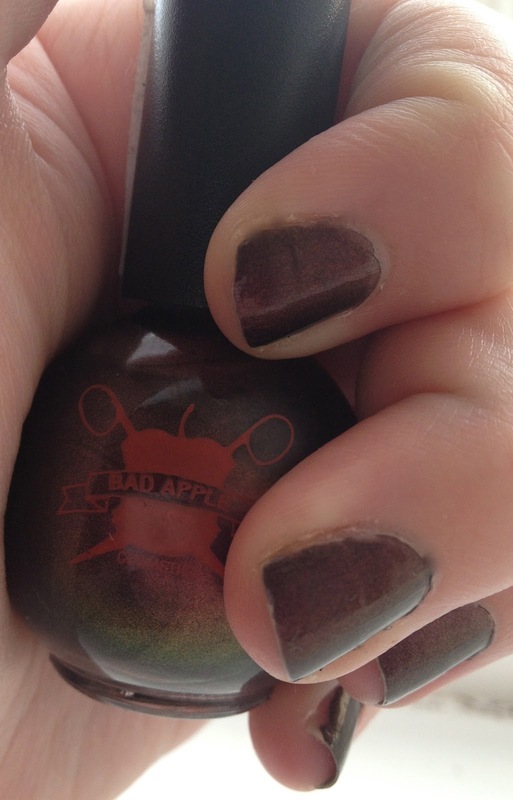 What do you think of Bad Apple Cosmetic's polishes? Had you ever heard of them? Would you be keen to try them out? I fancy a gorgeous pink or even a nail wrap next time!